The Cumberland & Dumfriesshire Farmers Mart P.L.C. 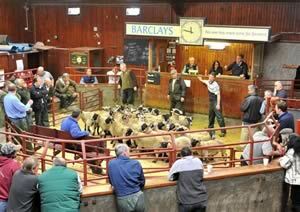 had forward 46 prime cattle, 3 young bulls, 17 over thirty month cattle, 4,857 prime lambs and 7,402 cast ewes & rams at their weekly sale at Longtown on Thursday 12th August, 2010. Clean cattle saw all classes similar on the week. Top price of 168.5p for Limousin heifers from Messrs J. Retson & Son, Gardrum, 163.5p Bleatarn, 159.5p Newby, 158.5p Bleatarn. Limousin bullocks to 167.5p Gardrum, 159.5p, 154.5p, 151.5p Dashwellgreen, 151.5p Newtown. OTM cattle met a brisk trade for a plainer show of cattle. Top price of 127.5p for a Limousin steer from Messrs L.E. Grice & Son, Newtown. Cast bulls to 116.5p (£1,112) for a Limousin from Messrs Ferguson, Sandbed. Cows to 102.5p for Limousin from Ladyhousesteads, 99.5p The Flatt, 94.5p Whiteclose; British Blue 100.5p Ladyhousesteads, 91.5p Tinnis Hall; Friesian 81.5p Blackrigg, 79.5p Peterscrook. Another good show 4,857 prime lambs was forward. Numbers and trade were similar on the week. The usual full ring of buyers attended to level the sale at 172.7p, keeping up with recent high rates. Top price per kilo was 208p for Texels from Winshield Farms, with a top per head of £90 and £87.20 for Texels from R.F. Forsyth, Baltier, others £86.20 Leaona Villa and Sharplaw; Charollais £86.50 Lanehead, £76.80 Broomhouse; Suffolk £86.20 Spoutbank, £85.80 Cardew Hall, £84.80 Sandholm; Beltex £82.20, £81.80 Waterside; Bleu d’Maine £81.80 High Stenries; Greyface £75.80 Harelawhill, £75.20 The Throp, £71.80 Nunscleugh; Cheviot Mule £73.80 Clover Hill; Half Bred £69.50 Kilncroft, £64.80 Dodgsonstown; Blackface £69.20 Crindledykes, £68.20 Catslackburn, £63.80 North Deanhead; Hill Cheviot £68.80 Catslackburn; Leicester £67.80 Ringliggate and Patties Hill. Lightweight lambs to £67.50 for Texels from Middle Farm, others £66.80 Quarryfield and Kilncroft; North Country Cheviot £65.80 Whitstonehill; Blackface £64.50 Balgray Hill, £62.80 Crindledykes; Suffolk £63.80 Graystale and Gatehouse Cote; Hill Cheviot £61.20 Effgill; Cheviot Mule £60.20 High Chesters; Charollais £60.20 High Dovecote; Swaledale £59.80 Coldshield; Greyface £57.80 Low Rough Hill, £56.50 Graystale. Yet another fantastic show of 7,402 cast ewes and rams was forward. Trade was slightly back from last weeks brilliant trade, however all classes were wanted and easily sold, keeping in with recent high rates. Top price achieved was £150 for a Texel tup from West Farm, others £134 Tree Farm; Dorset £131 Golden Lane; Suffolk £118 West Farm, £114.50 Townfoot; Leicester £116 Linton House; Rouge £112 Severs; Oxford £102 Lydden Court; North Country Cheviot £99 Maidencoates; Hill Cheviot £99 Potholm, £77 Skelfhill; Beltex £99 Newbigging; Bleu d’Maine £99 Roadside; Blackface £68.50 Blackburn, £67 Plenderleith, £63 Whitefield; Swaledale £48.50 Howburn. Heavy ewes to £136.50 for a Charollais from Loughrigg, £109 Seavers; Suffolk £126.50 Loughrigg, £123 Burnfoot on Esk, £119 Colte Coates; Texel £119 Roadside, £117 Severs, £116 Ballinliss; Leicester £112.50 Sanders Close, £109 Maidencoates, £103 Maryhill; Half Bred £105, £93 Burnfoot on Esk; North Country Cheviot £101 Wester Dunnet, £98.50 Relief, £92.50 Roadside; Greyface £100.50 Porteath, £92 Sceughdyke, £84.50 Kilfinnan; Beltex £96.50 Mouldyhills; Cheviot Mule £93 Newbigging, £87 Colmslie Hill and Hassendean Burn; Lleyn £93 Lydden, £88.50 Whitcastles, £85 Glebelands; Wensleydale £83 Golden Lane; Zwartbles £75 Linton House. Hill ewes to £84.50 for Cheviots from Compstonend, £72.50 Upper Ashtree, Compstonend and Sorbie, £71 Potholm; Blackface £65 Crindledykes, £64.50 Crowhall, £62.50 The Nook, £61 South Corrielaw; Swaledale £58.50 Roosecote, £56.50 Gapshield, £52.50 Sanders Close, £51 Coldshield; Jacob £55 Colmslie Hill and Blackyett House; Herdwick £38.50 Powheads, £36.50 Kinning Hall; Shetland £34.50 Newbigging.